Iwas recently told about a cool writing contest called "Truth in Words". It's being led by New York Times best-selling author and Oakland resident, Kelly Corrigan and author, publisher and daughter of the founder of Borders Books, Christine Borders Bronstein. 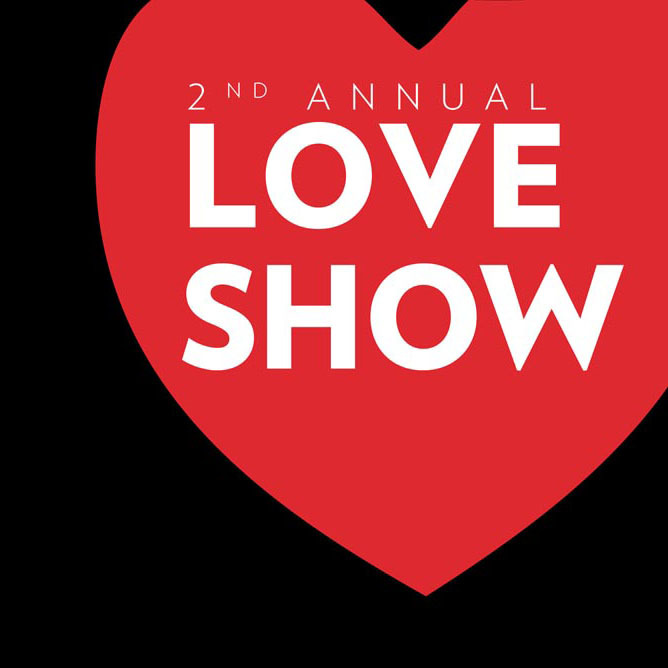 This year's theme is "Transitions" and they expect to see stories ranging from starting a family, recoveries, graduations, aging, career changes/promotions, marriage and divorce. The contest is part of a benefit for Children's Hospital Oakland. See the website for more details, but note that the deadline for essays is coming up soon—all entries must be received by March 18th. The grand prize winner will also receive two tickets to the Notes & Words 2013 performance and after-party on May 18, 2013 at The Fox Theater in Oakland, where they will have an opportunity to meet all of the performers. on one stage together entertaining you. That’s right, it’s all for you. The Notes & Words event will be on May 18th, 2013 at the Fox Theater. Tickets for the event will go on sale on March 18th. It's almost the beginning of March, so it's time for First Friday. After last month's tragic shooting, there will be some changes at this month's, including no alcohol. Let me know about other events by leaving a comment. Off the Grid at OMCA - Friday, 5-9pm. The Off the Grid food truck pod comes to the Oakland Museum for an evening of food and fun. Cherry Blossoms in Exile: Art and Music - Friday, March 1, 7pm. A new show in March brings the first all female group of artists to Blackball Universe Gallery for "Cherry Blossoms in Exile." The exhibit features the abstract works of Momoko Sudo, Tomo Kamiya and Ashley Adams, blending organic shapes and straight lines to explore themes of nature and of industry. 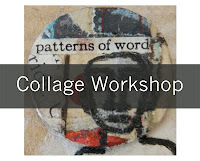 Titti Trifecta: female artists at MOCO - Friday, March 1. Artists Bobby Jean, Lee Miltier and Maria Yates take center stage at the MOCO gallery on 17th. Show opens on First Friday, March 1. Special events on March 10, 14, and 22. Tall ships tours - Saturday and Sunday, 10am-1pm. Walk-on tour aboard the Lady Washington and Hawaiian Chieftain tall ships that will be at Jack London Square until Wednesday, March 6. No reservation is required, but a donation of $3 is suggested. Read about last year's visit. There are also special "battle sails" where the ships will engage in a mock battle. Oakland Running Festival - Sunday, March 24. Whether you're a runner, a volunteer or a spectator, it's a great big blast of Oakland love. There's a 5K race, a 1/2 marathon and a full marathon. 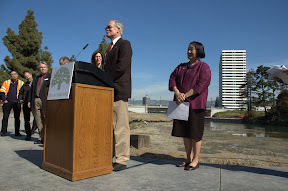 On Friday I attended a press event to celebrate the reopening of part of the channel between Lake Merritt and the estuary as part of the larger 12th Street Project. 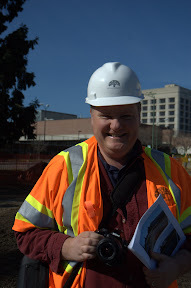 I was invited by Erik Niemann, who has been tracking the progress of the 12th Street Project on his blog. After the event, Erik and I talked a bit, and he mentioned a train tunnel nearby. 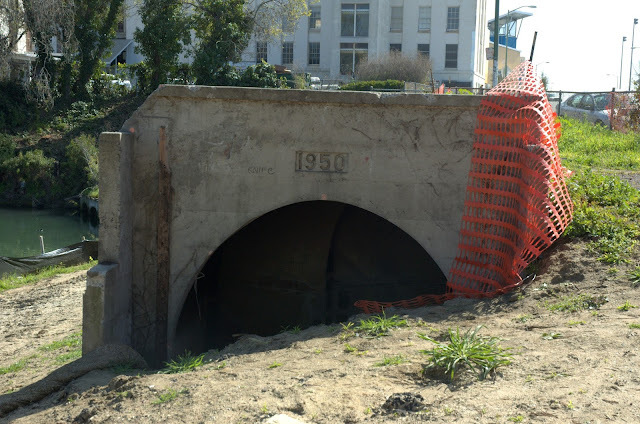 It seems that the site next to the Kaiser Convention Center had been home to a small amusement park called Peralta Playland, and the tunnel from the miniature steam train called the Oakland Acorn was still around. This was getting interesting. I had planned on stopping at the Oakland History Room before heading over to city hall to see an exhibit from the National Park Service about the Anza Trail, but now I had something else to research. When I got there, I checked out the current exhibit, which shows historical info about Oakland's waterways, which was fitting since I'd just been at one. I mentioned Peralta Playland to librarian Dorothy Lazzard, and she said, "Oh, have you seen the picture of Lil' Belle from there? It's part of the waterways exhibit." By this time I'd forgotten what I'd originally come to the history room to research. Peralta Playland, Lil' Belle, the Oakland Acorn, and who knows what other connections there were to research? I searched old Oakland Tribune articles, learning about some of the rides, and then I found a map showing the route of the "viking launch", which plied the waters between Peralta Playland, Children's Fairyland, and the duck pond on the east side of the gardens. And what's this? The Hippopotamus Train going overland between Children's Fairyland, through the gardens, to the duck pond and back? I've been putting everything I found onto the Oakland Wiki page I created for Peralta Playland. It's a good start, but there's lots more to learn, like: when did the park close? what was the story about the lawsuit over the creation of the "Star Flyer"? what other rides were there? Did you ever go to Peralta Playland as a kid? What are your memories of it? That wasn't Friday's only rabbit trail. 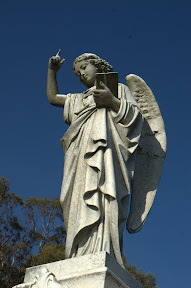 On my way to Lake Merritt, I was thinking about where to eat after. Woody's Cafe? Is Portal open for lunch? What about that pho place that @BikeBlogChris mentioned, Pho Ao Sen? That's around here somewhere. Riding from the library towards city hall, I thought, "oo...I could stop at Disco Volante! Or what about Aria, that Afghan place I've been meaning to try?" I did eventually make it to city hall to check out the exhibit. I decided to head up to Burma Superstar in Temescal, in part to check out the new bike rack in front of it. But my ride up Telegraph involved thinking about each of the following in turn: Rudy's Can't Fail Cafe, Telegraph, Commonwealth Cafe, Oasis Food Market, Beauty's Bagels, Homeroom, Cafe Eritrea, Arbor Cafe, maybe one of those Korean places, Lanesplitter...oops, wait. Right, Burma Superstar. I'm glad I waited...it was great. I'll write more about that some time. The 12th Street Project celebrated a milestone on Friday, with a parade of boats marking the opening of part of the channel between Lake Merritt and the estuary. It's part of the larger Measure DD work being done around Lake Merritt, and while there is a lot of work still to do, it was worth celebrating the progress. There were members of the community, local politicians, and various people who have worked on the project on hand to talk about the progress. I was invited by Erik Niemann, who has been tracking the progress of the 12th Street Project on his blog. He was delighted to have lots of people there to check things out, as usually it's just him and the construction crews. You may recall that Lake Merritt isn't really a lake, but a tidal slough. It was originally more open to the estuary, but was dammed by Samuel Merritt in the 1800s. There have been a long series of engineering mistakes since then, and tearing out "world's shortest freeway" and re-opening some of the channel to the estuary are working to reverse that. 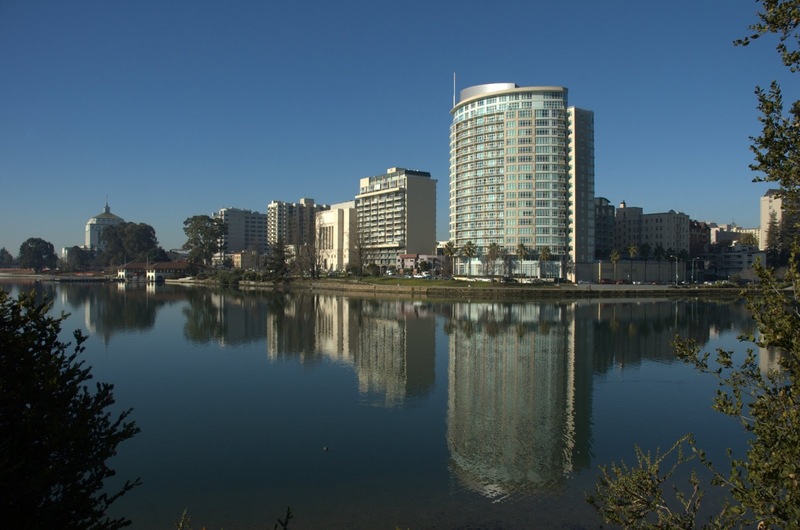 The result will be better water flow in and out of Lake Merritt, which will improve water quality, and provide more habitat for fish and birds. Speakers included mayor Jean Quan; city council president Pat Kernighan; Lesley Estes, Oakland Public Works Watershed Program Supervisor; a representative from the California Coastal Conservancy; Peter Perrine of the California Wildlife Conservation Board; and Dan NcElhinney of CalTrans. Also on hand were James Vann of the Coalition of Advocates for Lake Merritt (CALM) as well as an architect for the initial proposal; Joel Peter, who was manager of the Measure DD project before he retired recently; people representing the main contractor, McGuire and Hester; and members of the design team, including landscape architects, engineers, and hardscape architects. 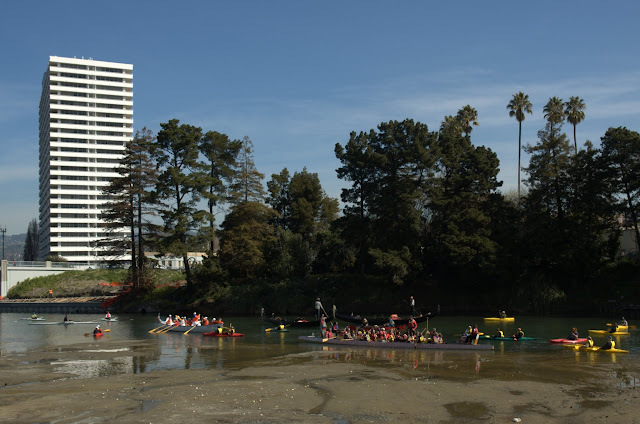 The parade of boats included kayaks, stand up paddle boards, a canoe, two dragon boats, the gondolas from Gondola Servizio, and the venerable Oakland Women's Rowing Club. It was a nice bit of symmetry to have the OWRC there, as they were present at an earlier Measure DD celebration, the opening of the Lake Merritt Boathouse back in 2009. There is still more work to be done, including planting native aquatic plants in the new marsh, landscaping and larger projects like tearing out the culverts at 10th Street, but it was a nice day to celebrate. A larger obstacle is the pumping station at 7th Street, but this is a big step in the right direction. Check out the Oakland Wiki's page on Black History Month for more events. There's an event about diversity in early California today at city hall, art shows opening and closing, and more. Pulitzer-Prize winning author Garry Wills - Thursday, February 21, 7pm. The Pulitzer Prize-winning author talks about his new book "Why Priests: A Failed Tradition", about transubstantiation, Catholic priesthood and all the trouble that comes from the book of Hebrews. Co-sponsored by A Great Good Place for Books. What I Hear, I Keep: Stories from Oakland's Griots - Saturday, February 23, 2:30 - 5:00pm. Opening of a visual and audio art installation at Peralta Hacienda based on African American stories of modern-day Oakland, with local residents telling about their lives and exploring their identities. On Friday I made yet another trip to Mountain View Cemetery, because I'd heard that the grave marker for Royal Towns had been located and lifted back to the surface. While there's tons still unknown, the Oakland Wiki entry for Royal Towns is starting to paint a picture of his life. But finding the grave a second time was easy, so I had lots of time after. So I did some exploring in Plot 36, in part to locate the grave of John W. McClymonds which McClymonds High School in West Oakland is named for. Plot 36 is very different than plot 54. It's older for one thing, but there's a lot more variety in the graves. 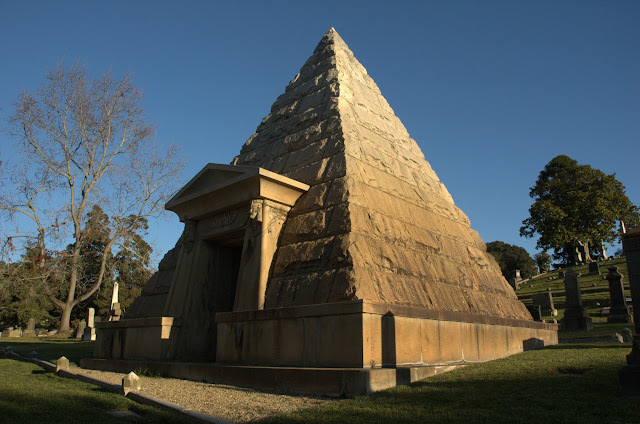 They range from flat markers like the ones in plot 54 up to one of the more well-known graves, the pyramid-shaped mausoleum of William McKendree Gwin and his family. He (along with John C. Fremont) were the first two senators from the new state of California in 1850. 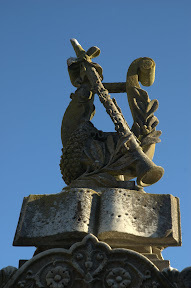 But there are tons of other interesting markers in plot 36, like the Hoffman/Hollo monument, topped by a lyre and a clarinet. Or the marker for Frank W. Haines (1858-1923), his wife Josephine M. (1867-1933) and Edward E. Haines (1879-1903). The tree-shaped marker with a dove, an ax, and "Dum Tacet Clamat" ("Though silent, he speaks") indicates he was a member of Woodmen of the World, an insurance company that dates back to 1890. There are numerous newer graves, too, like the one for Reginald A. Hayden (1979-2001) who was shot to death at 71st Avenue and Spencer on the 4th of July. Along a picture of Reginald, it reads "beloved son, brother, father, uncle and friend." There were also some familiar names, like Casebolt Daikin. I've heard that name as the architect of Cielto Lindo, a beautiful Moorish-Spanish style apartment building we saw on the Cleveland Heights and "Borax" Smith urban paths walk. This marker was for Virginia Casebolt Daikin (1836-1926) next to a monument for Frederick H. Daikin (1855-1917). Was there any connection between the architect and these Daikins? It's an unusual name. And back to an earlier question: was there ever a grave marker for John W. McClymonds? Was he even buried there? There are thousands of more rabbit trails through Oakland history like those that I wish I had time to explore. You can help, by contributing information to the Oakland Wiki. Saturday was the third annual Tour de Bière, a fundraiser put on by The Grand Cru to benefit the East Bay Bicycle Coalition. We had perfect weather for the ride, and as in past years, the tickets for it sold out quickly. I'm not the only one who enjoys beer and bikes, particularly in support of a good cause. We started in San Leandro at Drake's Brewery. They were kind enough to open early and offer tours. While we were checking in, we started with coffee from Bicycle Coffee Co. and breakfast snacks. The location was new to the Tour de Biere, but Drake's has been around since 1989. It was founded by Roger Lind and originally known as Lind Brewing Company. With 50 people on the ride, we had to split into smaller groups to go on the tour, so it took a while for everyone to go on it. 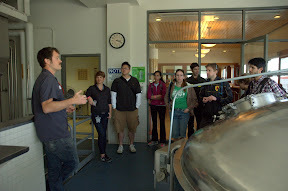 On the tour we heard about the brewing process at Drake's, but also about one of their specialties, barrel-aged beers. Normally after brewing, fermenting and filtering, a beer is pretty much ready to drink. Barrel-aged beers put the beer into oak barrels for further aging. The origin of the barrel, whether from wine-making or some other alcohol production affects the taste, as does charring the inside of the barrel. The beer is aged for varying periods, and the result is something unique. The one we sampled was darker, a bit smokey, and slightly sour. I loved it, but it's not to everyone's taste. After Drake's, we headed past the Oakland airport and into Alameda. After a brief rest stop on Bay Farm Island, we rode along the estuary and onto the island of Alameda (which wasn't always an island.) There we were greeted by one the mom of one of the riders who had made us fresh cookies! The ride along the estuary was particularly beautiful, as there were numerous shorebirds and other waterfowl. From Alameda we headed through Jingletown up along the estuary towards Jack London Square to Linden Street Brewery in West Oakland. There we were greeted by Andrew, head brewer and co-founder (Adam was busy in back watching a test batch being brewed.) Linden Street is partnering with James Sybahout of Commis and Hawker Fare to open a restaurant adjacent to the brewery in Linden Street (I reported on this back in December.) As a result, things were a bit chaotic in the tasting room, and much of the furniture had been moved outside. Andrew told us about the story of Linden Street (the first production brewery in Oakland since the 1950s) and kept us well-supplied with tastes of LSB's four beers. They brew "session beers", which are lower in alcohol than many beers today. The lower alcohol (generally 4% to 5%) allows you to drink more beer over a session without getting too drunk too fast. 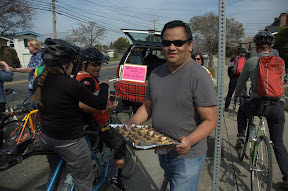 At Linden Street we were joined by El Taco Bike, which gave people the opportunity for a tasty snack. Then it was up through West Oakland and Emeryville to Aquatic Park in Berkeley, and on to the Trumer Brewery. We again broke into smaller groups for a tour of the brewery. Trumer is unusual in a number of ways. First, they make only one beer, Trumer Pils. The first Trumer brewery started in Salzburg, Austria, in 1601, and is still family owned. They pride themselves on making a pure, bright pilsner, so when they OK'd making Trumer in the U.S., the quality of the water was a big consideration. EBMUD water from the Sierra Nevada was perfect for their needs, but they still had to do a lot of back-and-forth to satisfy the exacting standards of the main brewers in Austria. At the brewery they have a quality assurance lab that tests the beer to make sure it's up to their standards. Trumer then opened their tasting room to us, where people enthusiastically drank some Trumer Pils. Our final stop was Pyramid Brewery, which is also in Berkeley not far from Trumer. 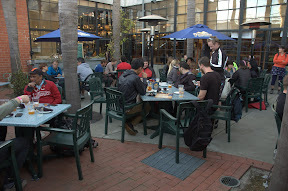 There we took over the patio and sampled a few of Pyramid's beers. Some people ordered food, while some went on a tour of the brewery. They don't allow photos inside the brewhouse, but there was interesting stuff to learn. We heard about Pyramid's history, from their founding in the Pacific Northwest to their expansion to Berkeley and several subsequent mergers. After the tour, the rest of us got food and some more beer, and sat and reflected on the day. It was another great Tour de Biere. There was about 20 miles of cycling on the tour, and I had another 17 or so to and from BART and home at the start and end of the tour, so it was a lot of riding. But the tour part was very flat, with the biggest hills being over the bridges to and from Alameda. Thanks to The Grand Cru for organizing it, to Drake's, Linden Street, Trumer and Pyramid for hosting it, Bicycle Coffee Co. for the coffee Clif Bar for the snacks, and to everyone else who made the day possible. 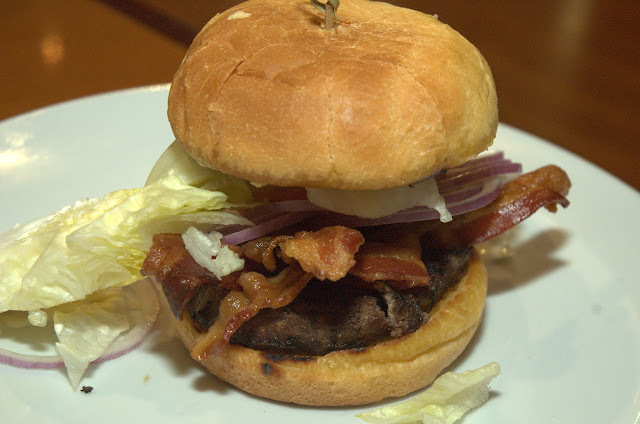 There's a great write up by Jenny Oh at Bay Area Bites with more pictures. 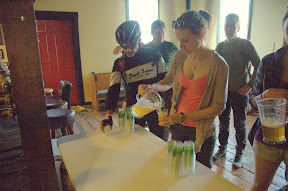 Read about the Tour de Biere 2012. We were up earlier than usual for an Oakland history event at the Lake Merritt Breakfast Club on Thursday, and walked through the gardens and by the lake afterwards. Today looks like another beautiful day—enjoy it, as rain is due next week! Invention Experience at Chabot Space and Science - Saturday, February 16, 11am-5pm. Students will solve an Invention Challenge by actually prototyping their own technology! Completed InventionX technologies will be entered into prize raffles and have opportunities to win more awards and contests through our online activities! 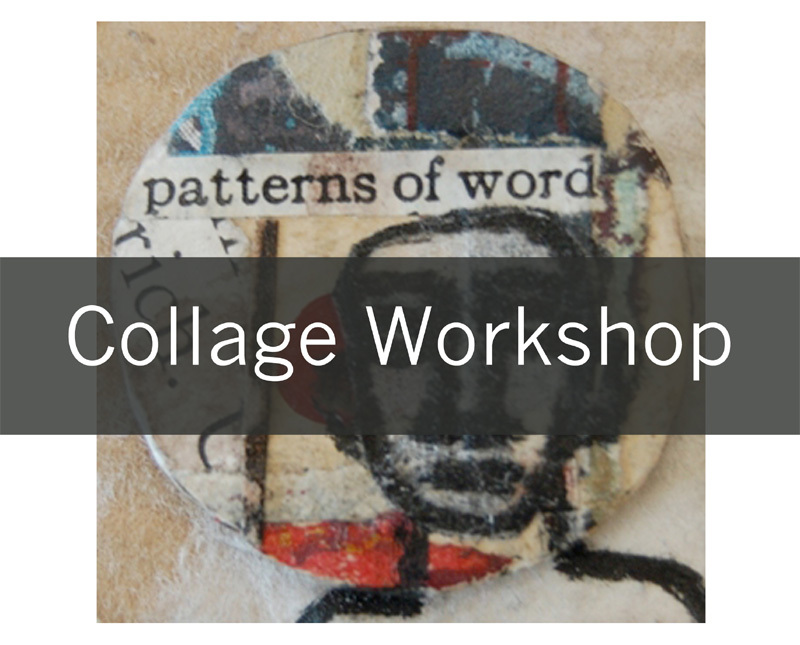 Sign up for this event – free of charge for early registrations. Lunar New Year Festival - Saturday, February 16, 11am-4:30pm. Happy year of the snake! Ring in the lunar near year at the Oakland Asian Cultural Center with arts and crafts, performances, and artists workshops. Last Sunday afternoon before the Oakland Wiki edit-a-thon, I stopped by Mountain View Cemetery to do some research on Royal Towns, one of the first African American firefighters in Oakland, and who helped other African Americans join the force. 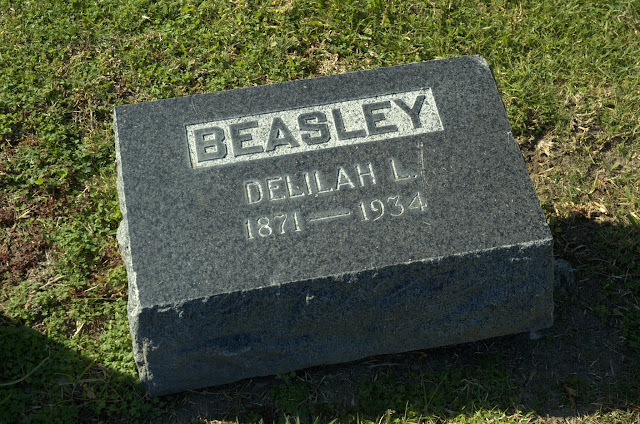 I recently learned that he was buried in Mountain View, and even had the plot and grave number (plot 54, grave #1915) so I went to check it out. I wandered around plot 54 looking for Royal's grave, examining the various markers. The markers in plot 54 are flat, originally placed at ground level to simplify lawn maintenance. Unfortunately, markers of all sorts have a tendency to sink over time, so what was ground level 30 or 40 years ago is now a couple of inches down. 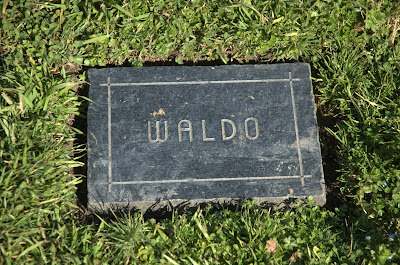 That's also true of the small, concrete numbers that are at the foot of each grave, and given their size, they tend to sink completely out of sight. So it wasn't too surprising that I couldn't find Royal's grave or even grave #1915. After a couple of trips into the office at Mountain View for plot maps and other records, I figured out where Royal's grave is. There is no marker visible, but a work order has been placed to see if there is one and raise it. Records indicate there are multiple people buried in grave #1915. 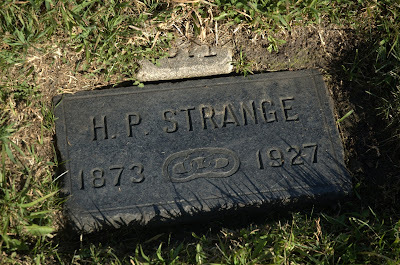 There are family members in the adjacent graves #1914 and #1913, so I've also been researching his family connections, too. It turns out there are connections, too. The first African American fire chief in Oakland was Sam Golden. He was in a boy scout troop led by Royal Towns. The woman who helped me at the cemetery office lived next door to Sam Golden and his wife. 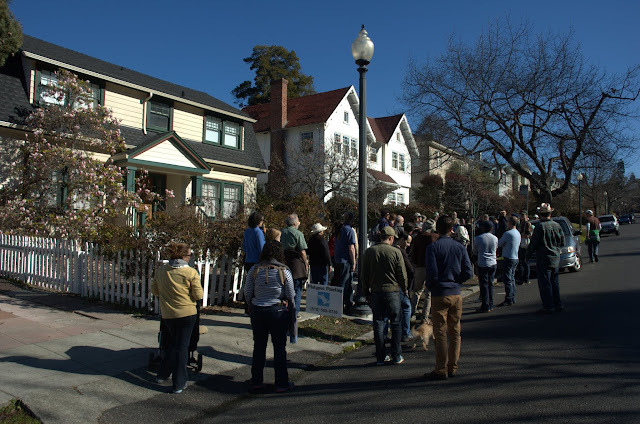 It's all part of following historic rabbit trails through Oakland history. 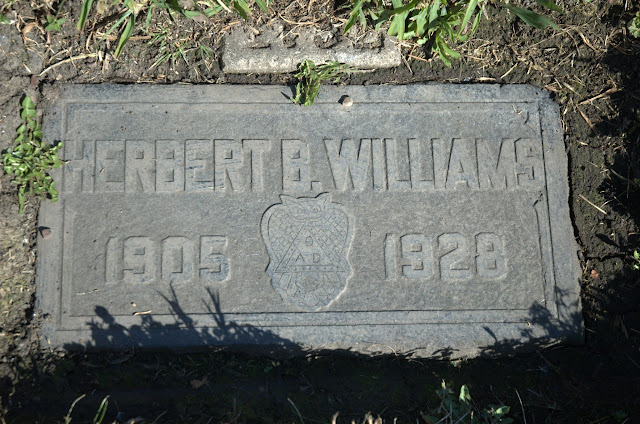 Some of the other markers in plot 54 caught my attention, like the one pictured above for Herbert B. Williams. He died young, approximately age 23, but what caught my attention was the symbol on his marker, as I hadn't seen it before. I checked my usual sources for grave symbols but couldn't find it. I suspect it was connected with the Freemasons, since (a) they had tons and tons of sub-orders and (b) the pyramid symbol in the middle of the owl is frequently associated with the Freemasons. 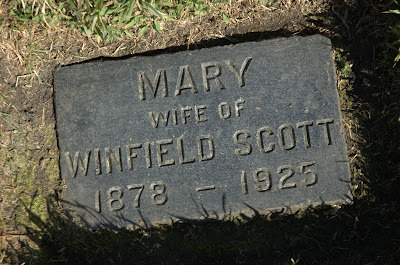 Another grave caught my eye because of the name, "Mary, wife of Winfield Scott, 1878-1925". Winfield Scott was a famous general in the Mexican-American War in the 1840s, and who the fort at Fort Point under the Golden Gate Bridge was originally named for. But his wife was Maria D. Mayo, who he married in 1817, so this was clearly someone else. Some searching on ancestry sites suggest that Mary Scott was the wife of Winfield Scott, who ran a cigar shop. The first shop and their residence was on Hayes Street in San Francisco. But by 1925 the cigar shop was in Oakland, at 3735 East 14th Street. I don't know for sure this was them, but that's another rabbit trail that will have to wait for another time. We started on Trestle Glen near Lakeshore Ave. near one of the ornate gateposts that date back to the early 1900s when the area was first developed. The streets were laid out by the Olmstead brothers, and some of the houses designed by noted architects Julia Morgan and Maybeck & White. You may recall that Mt. View Cemetery was designed by Frederick Law Olmstead, the father of the Olmstead brothers. Read more about the history of the Lakeshore area on the Lakeshore Homeowners Association (LHA) website. Then we headed up Mandana Blvd. and up our first set up stairs into Oak Grove Park. It's a privately-owned park between lots on Mandana and Longridge. Heading back across Mandana, it was time for stairs, stairs, stairs! 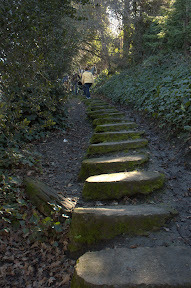 Some of these stairs I worked on last fall with a group Oakland Pathways Volunteers to clean them up. This is exactly the sort of neighborhood effort Oakland Urban Paths would like to see all around Oakland. While the cleanup efforts have made the steps a lot easier to navigate, there's still a lot of work to be done on some of them to repair the steps themselves. The neighborhood is known as Trestle Glen, for the rail trestle that once crossed the canyon to Sather Park. That was built in 1893 by F.M. "Borax" Smith, the real estate magnate of the Realty Syndicate who eventually developed the Key System. Before that it was known as Indian Gulch, named by early Anglo settlers for the seasonal Ohlone village there. We then walked into Crocker Highlands, once part of the William H. Crocker (son of Charles Crocker of the "Big Four") estate. The area is full of beautiful homes, many also dating back to the original development. That was started in 1911 by Wickham Havens, son of Frank Havens of the Realty Syndicate. Going up and down lots more stairs and some hilly streets, we eventually reached Park Boulevard, and stopped for a coffee break and for people to catch their breath after all the climbing to get there. We returned to our starting point by a different set of stairs and streets, and many people headed off in search of lunch on Lakeshore or nearby Grand Avenue. Another great walk! Thanks to everyone and everywoof who came out to join us. The location for the OUP walk in March hasn't been set yet, but it will be on Saturday, March 9th (the 2nd Saturday, as usual). Let me know if you have photos from the walk you'd like to share. Yesterday after the rains stopped, I rode into Mountain View Cemetery to visit a family mausoleum space, and stopped to take this picture of the Chapel of the Chimes against the beautiful sky. I was also doing some scouting for an upcoming "Jack and Julia" bicycle history tour, along the lines of the 5 Historic Houses Bike Tour we did last year. 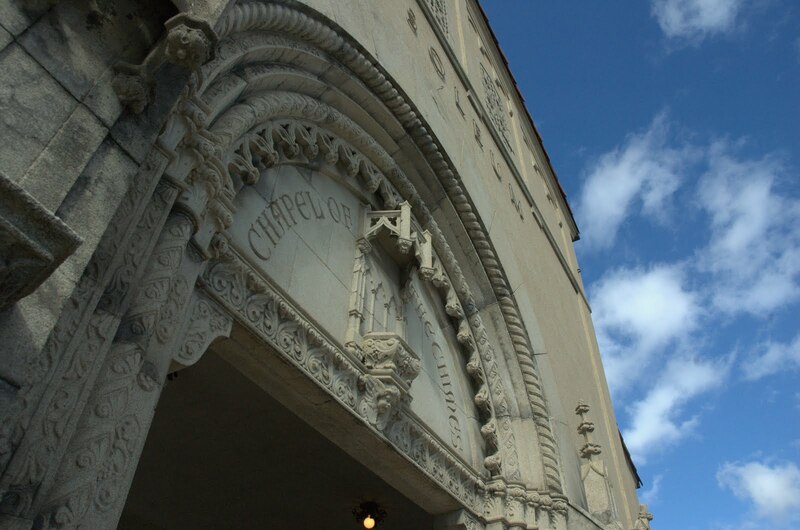 Julia Morgan of course, was one of the architects who worked on Chapel of the Chimes over the years. February is also Black History Month, so there are a variety of events for that coming up. I've listed a few; for a more complete list check out the Oakland Wiki's page on Black History Month. There are also art events, food events galore, and another Oakland Urban Paths walk on Saturday. 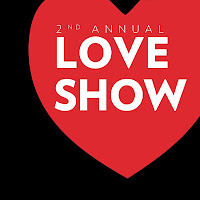 Valentine Jazz and Wine Stroll - Friday, February 8, 5pm. Live music, food and drink specials all along College, from Alcatraz to Broadway. Vietnamese banh mi sandwiches, made with bread fresh from Bui-phong Bakery in Oakland, and your choice of marinated braised pork, plancha-seared chicken or tofu. Lettuce cups with wok-seared tofu, red cabbage and fresh cilantro (a dish that's gluten-free and low fat). Curried chicken lavash wrap, with green onion and celery. House-made vegi burgers, made with black beans, brown rice and spices. Seasonal choices like fresh made clam chowder. Are these menu items from downtown Oakland's latest hip restaurant? Nope. 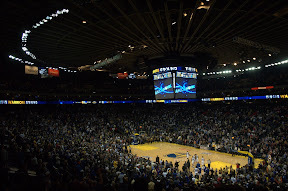 How about at the Oakland Coliseum Arena (aka the Oracle Arena), available at Warriors' games, concerts and other events? It's a general expectation: food at sporting events won't be that great, or may even be downright bad. But it's sports, right? Go to a game, get a boiled hot dog. Many Bay Area venues have more diverse food menus that reflect the wants of the fans, but even with variety, they're not generally known for great food. Executive chef Tim Radack is working to change that. Tim has been in charge of the food at the Arena for the last 4 months, and is passionate about food. Between events, he works on improving the food. During events, he can frequently be found checking with diners to make sure things are OK. He leads a team with one other chef, 2 or 3 supervisors and 20 or so cooks who all work out of a surprisingly small kitchen. They produce tasty food for a lot of people in short amount of time. Not only do they produce food for the 72 suites, but for the various stands around the arena, too. 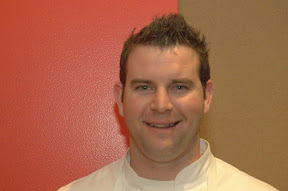 Before coming to work at the Arena, Tim worked in Chicago as the executive chef at an arena there. 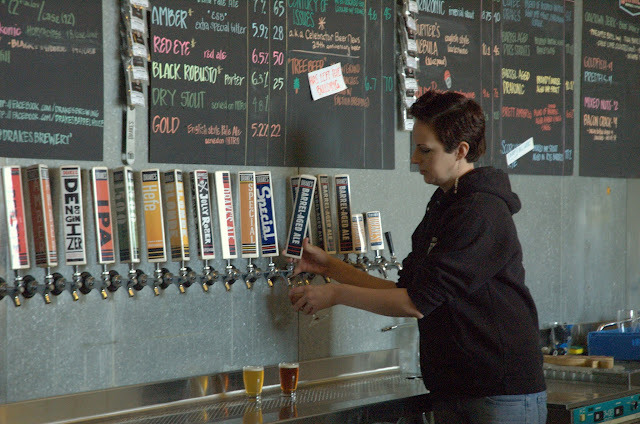 "There's a lot more variety in the tastes here [in the Bay Area]. There it was definitely more a 'meat and potatoes' mindset for a lot of people." In keeping with people's taste for variety, there are a lot of choices. On the club level alone, Tim gave a quick count of nearly 30 different items. The variety of the tastes of fans is a challenge, but one that Tim seems to enjoy. That doesn't mean all the fans are gourmands; hot dogs and chicken tenders are still some of the biggest sellers. But Tim is working to improve those, too. In partnership with Kaiser Permanente, there are also some healthier choices available at special "Healthy Picks" stands around the arena. These include low-fat and low-salt items as well as other tasty treats like fruit. Next time you're at an Arena event, consider your options before you just buy a hot dog. I'll definitely be looking for the Banhwich sandwich stand. It's my photo of a historic photo of Oak Hall, the mansion of F.M. "Borax" Smith on the Arbor Villa estate. We viewed where it stood on the recent Oakland Urban Paths walk, but there's not much there to see except where things were. 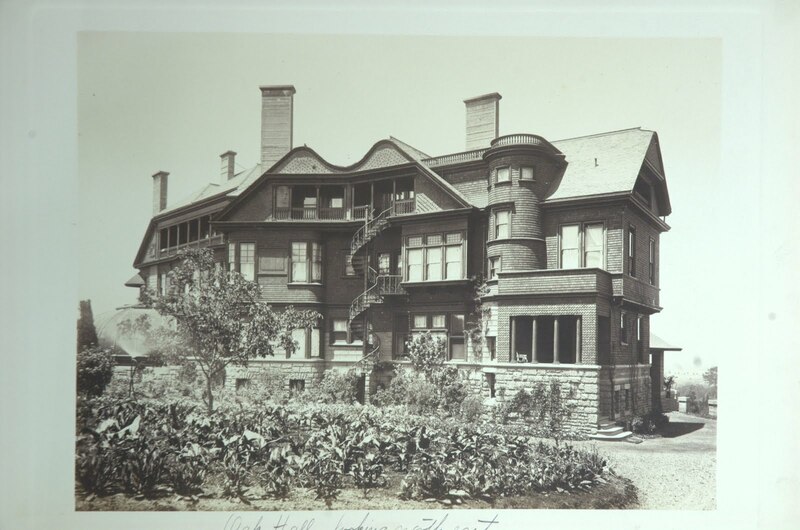 You can read more about Arbor Villa, "Borax" Smith, Mary Smith and more on the Oakland Wiki. You can contribute to Oakland Wiki, too, and write about Oakland's past and present.